Drivers Education Blog > Teen Driving Tips > Does Your Car’s Color Improve Its Safety? Buying a new car comes with all kinds of decisions. The features, safety tests, and price all have an influence on a buyer’s final choice, but color is one of the dominating factors when it comes time to buy. There are a lot of legends that fly around about how color influences its safety, but which of these are fact and which are fiction? Fact: The answer to this one is that no one can really give a definitive answer. Yes, these colors are more visible on the road, but that doesn’t mean you should count on them as a bonus safety feature. An Australian study done in 2007 shows that white vehicles are 10% less likely to crash during daylight hours, as compared to colors like black, green, gray, red, and silver. Federal government studies show that you can get a similar benefit by using your daytime running lights too. Fact: This is also an area of little study. In 2011, Applied Energy did a small experiment though, where they put two Honda Civics next to each other in the sun, one silver, one black. Checking the internal temperature after an hour, the silver car was approximately 10 degrees cooler than the black car. This doesn’t mean your vehicle is safer to leave people or pets in during the summer heat, but it does make your ride a little more comfortable when you first get in. Fact: The Insurance Information Institute says both are urban myths. 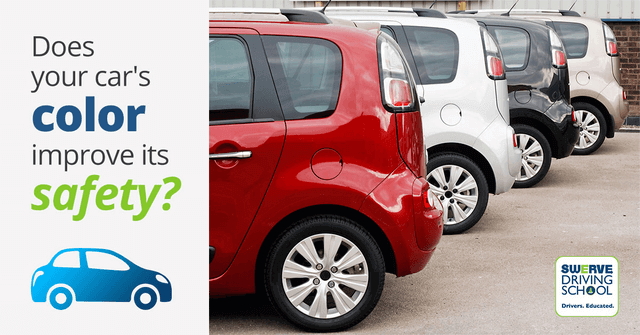 The underwriting for insurance does not typically include car color as criteria for pricing. The legend is based on correlation. Red is one of the most popular colors for sports cars. Insurance companies do consider if the car holds up well in a crash and how much the car costs to repair and replace. Sports cars don’t rank well in any of these areas, making insurance coverage more expensive for these types of vehicles. Similarly, people tend to want to drive faster in a sports car because that’s part of the fun. Driving at higher speeds increases chances of traffic incidents, which also drives up the cost of insurance and the chances of getting a speeding ticket. Fact: This legend is true. White, silver, and black cars are all more susceptible to theft. In a 2010 research report from Tilburg University in the Netherlands, cars with more popular paint colors were stolen approximately 40% more than less popular colors. The reason is because popular colors are easier to turn around and sell. Less popular colors, like orange, have two disadvantages here for the thief. First, the car is easier to spot at a distance, increasing their chances of getting caught quickly. Second, it is harder to find a buyer for an orange car. In the United States, white is becoming the preferred color for most luxury vehicles, meaning they are also targeted for interior thefts. White cars also tend to become part of the crowd in a parking lot, drawing less attention from potential witnesses to the break-ins. Color has an influence over different aspects of safety. However, you are going to get positives and negatives to each one. Instead of worrying over which one will give you a slight advantage to being spotted or having your vehicle stolen, focus on your driving skills. Your abilities as a driver are the largest factor to safety, not the car color. Become a part of the solution today.